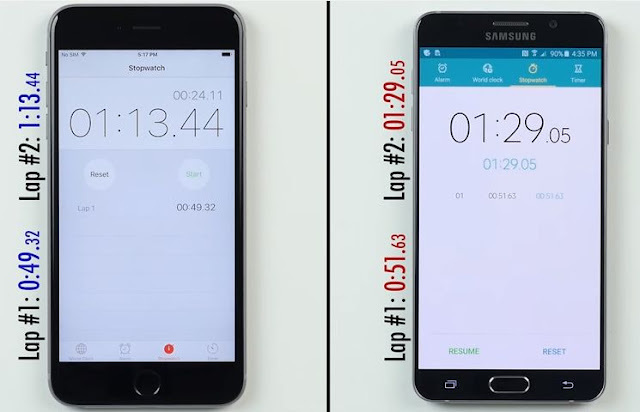 Galaxy Note 5 or iPhone 6s Plus: Which is faster - and should it matter? Samsung and Apple are tow main rivals in the smartphone world of today and each has been trying to outscore the other by launching flagship after flagship. Year 2015 has witnessed two of the top of the line gadgets unveiled and marketed by Samsung and Apple: the Galaxy Note 5 and iPhone 6s Plus. The tech geeks have been trying their best to find out which of the either outscores or outspeeds its equally hot rival. I came across this video by PhoneBuff on YouTube and thought of sharing it for my viewers to watch and judge/decide which is running faster.